In India even the plainest brass or copper domestic utensils have always been made with a remarkable beauty and variety of form. The loṭa, a globular or melon-shaped water-vessel with a reflexed rim by which it is carried, is one of the most common types, being universally used by Hindus for ablutions ans other purposes (Muslims generally used spouted ewers, to provide the freely running water required by religious law for their ablutions). 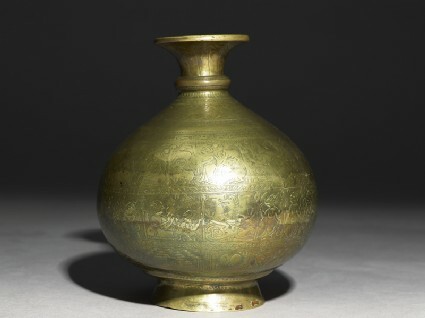 More elaborately decorated vessels such as this brass cambū, which differs from a loṭa in its narrower neck and short conical foot, were made for use in religious ceremonies. It is of a type associated with the holy city of Benares (Varanasi, or Kāśī) on the bank of the Ganges, the abode of Śiva and a major pilgrimage centre for countless centuries. The content of the several bands of incised decoration around the body of the cambū suggests that it was made for a Vaiṣṇava rather than a Śaiva worshipper. 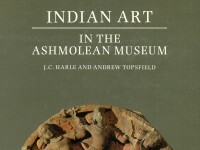 Similar vessels which have been found in various parts of India were probably sent from the Benares as containers for Ganges water. The cambū is of near-spherical shape, rising to a pointed apex and everted lip with lotus petal decoration; the interior of the base is missing. Of the five principal registers of decoration, the uppermost depicts eight figures of Kṛṣṇa and the milkmaids dancing with linked hands in the rāsamaṇḍala circle. Further below is an inscribed band with a thrice-repeated invocation to Rāma (śrī rām nām jaya rām nām). Beneath this are two broader central registers. The higher of these comprises eight scenes of the exploits of Kṛṣṇa, including the theft of the milkmaid’s clothes, the raising of Mount Govardhana, the subduing of the snake-king Kāliya and the slaying of the evil king Kaṁsa; the lower has twelve scenes, showing Gaṇeśa, Śiva seated on the bull Nandī with the Ganges river issuing from his hair, and the ten avatāras of Viṣṇu, ranging clockwise round the bowl (the Jagannātha trio appears as the ninth avatāra, between Kṛṣṇa and Kalki). The Ganges stream pouring downwards from Śiva’s head traverses the next band of decoration, which consists of schematic scenes representing the temples and sacred sites on the Panchakroshi road. This famous route encircling Benares is followed by pilgrims circumambulating the holy city to expiate their sins; the journey normally takes five days and includes visits to 108 shrines along the way. Various deities presiding in the main temples are here depicted, interspersed with several liṅga shrines, a Nandī, a Viṣṇupada (footprint of Viṣṇu), groups of religious vessels(? ), a temple tank with pillars at the corners, a sun symbol and a conventional tree or plant (reported by Mrs. Rivett Carnac as representing the gram plant, an important source of food). The stream from Śiva’s locks then enters the lowest band encircling the base of the cambū, which represents the sacred Ganges river itself. In it are depicted a primordial tortoise (Kūrma avatāra ?) guarding the point of inflow, four large fish, an empty boat with four oars, six conch shells and a large snake. A comparable cambū in the Victoria and Albert Museum (I.S. 464-1883), with slightly more compressed body shape and a less worn decorative surface, is inscribed with a date V.S. 1822/1765-66 A.D. 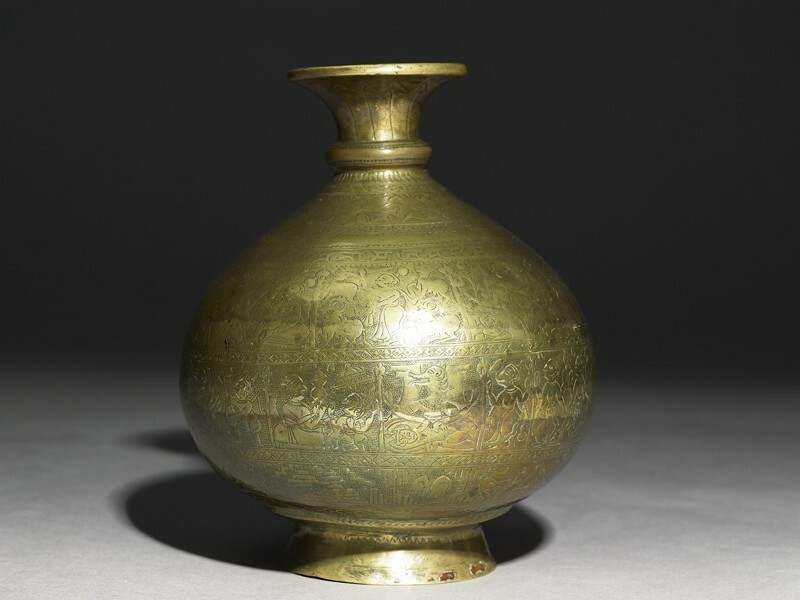 The chambu is a type of Hindu lota or water vessel, originating at Benares as a container for holy Ganges water. This chambu typically has multiple bands of incised decoration, including scenes from the early life of Krishna and of Ganesha, Shiva on his bull with the Ganges flowing from his hair, and the ten incarnations of Vishnu.